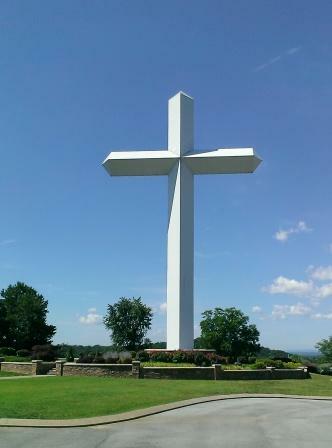 Anybody who drives Hwy 153 and/or Lee Hwy knows the big white cross which looms over its juncture. What you don’t see is the church which sits across from it, and you wouldn’t know it was there unless you were purposely looking for it. We went through the old American Thrift and McKay’s Bookstore parking lot, and as we looked for an entrance saw what appeared to be a gated community. Wendell and I both looked at each other and grinned – this was definitely going to be interesting. Even the sign tells you the hours the iron gate is unlocked. As we made our way up the hill and rounded the corner, we were met by a massive parking area, the white cross, and what appeared to be a country club. Their website describes the location and architecture as “evocative of a mountain lodge, with views of Lookout, Signal, Mowbray and White Oak Mountains.” Beautiful indeed with mountain stone, archways, and lots of windows. We were greeted with smiles and told where to take our granddaughter. We went through a typical sign-in process and received a ticket – half of which went on her back and the other half to me. It was the last day of Vacation Bible School, so her Sunday School class was packed. She was a bit more apprehensive than the last church we visited, but after some coaxing and telling her all was well, she allowed herself to be drawn in by one of the teachers. 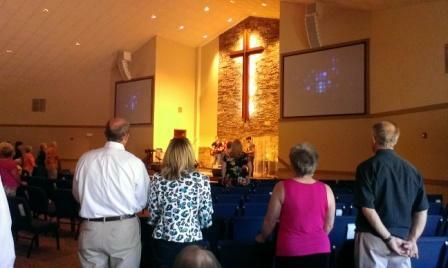 Wendell and I then made our way into the sanctuary where a worship band was playing. We picked up a bulletin and found seats towards the back. One only need browse through their Sunday bulletin to realize they are definitely using technology to their advantage (which I think is great). Do you prefer to receive texts about upcoming events? You can text 72727 to receive all their updates. How about an email? You can drop your email address in the offering plate and they’ll add you to their list. Interested in serving or participating in Bible Studies? Sign up to help at one of their activities or show up at one of their studies throughout the week. You can also donate to their food pantry which even has a freezer (hey – my opinion – go to Save-A-Lot and pick up their 5 for $19.95 meat deals. You can bless a needy family with ground chuck, pork roasts, chicken, bacon, and lots of other things that freeze well). They have a standard band with guitar and drums and the music is contemporary christian. My husband put his hands in his pockets and closed his eyes to worship and I began to observe. I noticed different age ranges and different styles of dress. While most everyone stood throughout the worship time, it was pretty laid back – not a lot of hand raising or loud singing or anything like that. After several songs, I leaned over and asked my husband, “Well, what do you think?” He looked at me, smiled, and said, “It’s pretty.” Indeed it was. And I’ll be honest – I tried to clear my mind and worship – but I think my A.D.D. had kicked in (I have a legitimate diagnosis for adult A.D.D, but don’t take medicine), and I was antsy and ready to sit down and delve into the message. Don’t judge me – ha! You know you’ve probably felt that way a million times, but didn’t want to admit it. After the music was over, the pastor got up to greet everyone. I learned later that he is pretty new to the church and he appeared to be around our age (early 40’s – maybe late 30’s). He told the congregation that the whole purpose of gathering this morning was to “meet God, come into His presences, be ‘us,’ and grow in Him.” After a time of shaking hands and greeting people (which by the way is one of my pet peeves in churches – sorry – it just is – but most of them do it, so I just grin and bear it), Jimmy Goddard took a seat and started his message. This was week 1 of a series called “Guardrails.” He explained that a guardrail is used on things like bridges, medians, and curves and there are usually signs posted before you get to the dangerous sections of these things to alert you. The guardrail is intended to keep you from straying into a dangerous or off limit area. For our purpose however, as children of God, he defined a guardrail as “a personal standard of behavior that becomes a matter of conscience.” And just as our human fathers want to love and protect their children by setting up guardrails (don’t get near the street while you’re playing; be in by 9:00pm; text me when you get there), so our Heavenly Father has also set up guardrails to protect us. One place in scripture that shows us this is Ephesians 5:15-20, specifically verse 18 which in paraphrase states we are not be drunk because it leads to debauchery; instead be filled with the Holy Spirit. He challenged us to think about this specific activity – drinking to the point of drunkenness. Is it the drinking that’s a sin? Is it the drunkenness that’s a sin? Or is it the things that happen once you’ve reached the point of drunkenness that cause you to enter into gross sins? Debauchery refers to an extreme indulgence that results in a loss of control. So, the question is, where do you set up your guardrail? He didn’t answer the question for us, but allowed us to contemplate the extreme consequences that most people pay because of allowing themselves to drink to the point of drunkenness which then led them to some extreme action which causes them to lose control of…finances, relationships, jobs, spiritual condition, morals, self-respect…the list is long and varied, but results in a loss of something every single time. My husband and I both looked at each other and nodded – we understand it all too well. We have both experienced our own addictions that have caused us to lose control, which in the end have caused us to lose more than we care to even think about. And trust me, the climb out is much more painful and always longer than the climb in. The guardrail should be set way before the vice ever has a chance to grab a hold of you. My favorite part of this Sunday’s experience was Reverend Goddard’s message. He was down-to-earth, didn’t preach “at” but rather talked “with” us; he was willing to share his own life and seemed to be transparent and willing to share the struggles with us – like his message included him. I like that about a pastor – when they include themselves in the teaching and you’re not left feeling like you’ve been talked at all morning. My husband leaned over and said – “Ya know, no matter where we end up on a Sunday morning, God always has a way of speaking directly to me.” We had just discussed something of this nature the night before – setting boundaries and what is ok and not ok – our own struggles and challenges with sin in our lives – how to beat it – how to resist the devil and flee from temptation. The band returned to the stage and the closing song DID catch my attention and calmed my restless mind – Jesus Paid It All. I sang every word and allowed Jesus to quiet me and remind me of His great love for me – so much so that He paid the ultimate price – His life – so I could be His child. And I committed in that moment to be aware of the guardrails that I need to set up. Sometimes I skate on the surface of temptation when I need to just take about three steps back and not even allow myself to see the edges of it. Graceworks seems to be a family-friendly church and their creed of faith is adopted from the United Church of Canada. They focus on receiving broken and hurting people into their community and sharing the mercy and forgiveness of Christ with them. Graceworks is located at 6445 Lee Hwy Chattanooga, TN 37421. Their phone number is 423-648-9125 and their website is www.graceworkschurch.com. Find them on Facebook at https://www.facebook.com/pages/GraceWorks-Church-Chattanooga-TN/120617741283516?hc_location=timeline.